As we near the heart of spring sports season, the golf teams are simply picking up where they left off in the fall. Garcia added that both teams have been competing in tournaments down south during the winter months against Division I and Division II schools and stacking up well. The women’s team has not lost to a fellow Division III school since October. The women play under the senior leadership of Katie Lease, Christy Conley and Janie Moller. Though graduating three seniors could put such a small team at a disadvantage, Lease speaks of young talent within the ranks. Lease spoke highly of freshman Madison Harsh, as well as transfer student Sydney Kelly, whom she called “amazing for us.” She also mentioned the consistency of junior Kate Kinley as a positive element as the team moves forward. Coach Garcia also praised the work of the men’s team throughout the season, saying that they are talented despite their age. Junior co-captain Logan Holbrook commented on the success of the men’s team, saying that a third-place finish during the fall season will pair them up with the top two teams in the OAC for the spring tournament. 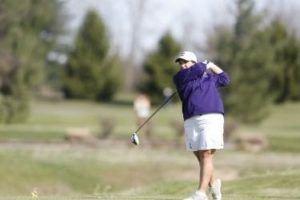 Holbrook was also an individual medalist during the fall season, notching a first-place finish at the University of Mount Union’s Raiders Fall Classic. The men, like the women, will also graduate three seniors: Ben McCollough, Ryan Kimmerling, and Justin Dearth. As the spring season progresses, Coach Garcia says that Otterbein University is a target for both teams, especially the men. In addition to Otterbein, the University of Mount Union is the team for the women’s team to beat. Regardless of their competition throughout the OAC, Garcia is optimistic about the potential that both teams display.